This Polish icon hangs in my home. To me it typifies the convergence of the old tradition of iconography and contemporary art. It is a work by the Polish artist Jerzy Nowosielski (1932-2011). He gave – with respect for the religious tradition in which he stands – an interpretation of his own of familiar biblical stories. This is what visual art does more often: seek surprising forms to provide well-worn paths with a new surface. 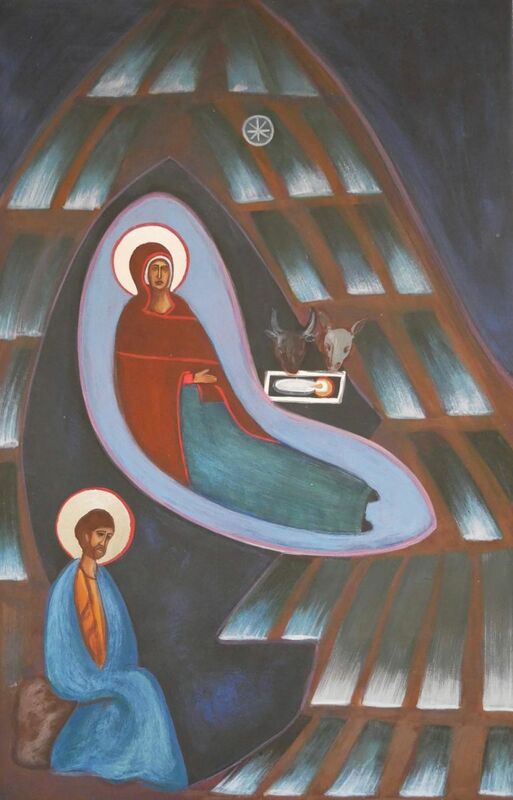 A startling painting of the Nativity can for instance make you look at Christmas with different eyes and can add new accents to your appreciation of this special feast. That is exactly what ArtWay wants to achieve. The visual arts cultivate a fresh and renewed view of deeply entrenched values. That is why we are happy to provide an online platform for old and new art rooted in the rich Christian tradition, so that a wide audience can become acquainted with it. Also this year our editor-in-chief Marleen Hengelaar-Rookmaaker, our Canadian associate editor Laurel Gasque and American assistant editor Victoria Emily Jones worked hard to make ArtWay a website of value. They do this as volunteers, deeply motivated to try and bring a wide range of art into the limelight. Once again ArtWay reached more people than the year before: daily 2500 visitors on average browse around in our digital art world. During Advent, Lent and Easter the number of visitors rises to 3500 per day. Half of the visitors come from the Netherlands and Belgium, while the other half come from all over the world, with countries like the USA, England, France, Germany, Canada, Brazil, India, the Philippines and Ukraine taking the lead. This boils down to one million unique visitors a year, which may arouse the envy of quite a few art museums! This year we worked on setting up French and German sections on the website. They are still small, but growing. We were happy to discover that the number of French reading visitors to the website went up considerably. Our weekly visual meditations reach 4100 subscribers, half of which are English reading. You are invited to let friends and acquaintances know about this service. In fact, encouraging subscriptions might be the best Christmas gift you can give them. It lasts all year round! For quite a few people the meditations offer a breathing moment amidst a never ceasing stream of messages, feedback from pressured professionals to pastors makes clear. In the Netherlands we have helped set up an art minor at the Christelijke Hogeschool Ede (CHE), so that there will be a place art students can go to when they seek to connect their art and their faith. Something like this was lacking in the Netherlands. Marleen is also working hard on a book about Christianity and art with an added focus on Calvinism and Neo-Calvinism and art that will be published in Dutch and English next year. ArtWay is for 100% run by volunteers. For the expenses we make we depend on donations. That’s why we call upon your generosity: your gift can be remitted online. Go here to give a donation. When you prefer to send us a cheque, here are our account details: Account holder: Stichting ArtWay, Sloetmarke 33, Zwolle. IBAN: NL25INGB0003847269; BIC (also known as Swiftcode): INGBNL2A. The ArtWay team and board wish you a rich and creative Christmas and 2018. NB – Would you like to know more about the work of the Polish artist Jerzy Nowosielski? Then go to a presentation of his icons here: https://www.youtube.com/watch?v=hBslyBqzoU0. PS – For a recent presentation about ArtWay by our chairman Wim Eikelboom, go to https://www.youtube.com/watch?v=1EWtKVuHFmQ&t=24s. Alexandrova, Alena. Breaking Resemblance: The Role of Religious Motifs in Contemporary Art. New York: Fordham University Press, 2017. Focuses on the ways contemporary artists rework religious motifs as a means to reflect critically on our desire to believe in images, on the history of seeing them, and on their double power—iconic and political. Besides discussing a number of exhibitions that take religion as their central theme, the book devotes four chapters to individual artists: Bill Viola, Lawrence Malstaf, Victoria Reynolds, and Berlinde de Bruyckere. Bishop, Brian Leslie. The Continuing Dialogue: An Investigation into the Artistic Afterlife of the Five Narratives Peculiar to the Fourth Gospel and an Assessment of Their Contribution to the Hermeneutics of That Gospel. Eugene, Oregon: Resource Publications/Wipf and Stock, 2017. Five paintings based on each of the five narratives particular to John’s Gospel—the Wedding at Cana, Jesus and the Woman of Samaria, the Woman Taken in Adultery, the Raising of Lazarus, and Jesus Washing the Disciples’ Feet—are considered in context. These are taken from the early fourteenth century (Duccio and Giotto) to the twentieth and twenty-first centuries (Max Beckmann and Constantina Wood). Blyth, Caroline, and Nasili Vaka’uta, eds. The Bible and Art, Perspectives from Oceania. London: Bloomsbury Academic, 2017. This collection of essays explores ways that the visual art of Aotearoa New Zealand, Australia, and the Pacific Islands engages with the stories, themes, and theologies of the Old and New Testaments. Buggeln, Gretchen, Crispin Paine, and S. Brent Plate, eds. Religion in Museums: Global and Multidisciplinary Perspectives. London: Bloomsbury Academic, 2017. Most museum collections include religious objects, and an increasing number are beginning to address religion as a major category of human identity. This global survey of religion in (art, archaeology, anthropology, and history) museums provides a range of case studies, from museums devoted specifically to religious diversity to exhibitions centered on religion at secular museums, and charts a course for future research and interpretation. Case-Green, Karen, and Gill C. Sakakini. Imaging the Story: Rediscovering the Visual and Poetic Contours of Salvation. Eugene, Oregon: Cascade/Wipf and Stock, 2017. This coursebook invites groups to engage with the biblical metanarrative through art and poetry. Featuring works by a variety of artists and ideas for creative projects, each chapter guides participants through (1) reading a scripture passage, (2) responding, (3) reflecting, and (4) making. Giebelhausen, Michaela. Painting the Bible: Representation and Belief in Mid-Victorian Britain. London: Routledge, 2006, 2017. (Paperback edition) Charts the emergence of a Protestant realist painting in a period of increasing doubt, scientific discovery, and biblical criticism, with particular attention paid to the Pre-Raphaelite Brotherhood, especially William Holman Hunt. Gordon, Alastair. God Art: Signs of Faith in Contemporary Art. London: Morphē Arts, 2017. Written and published by the cofounder of the Christian creatives network Morphē Arts, this sixty-four-page booklet comprises the author’s reflections on the ongoing discussion between faith and art. Heal, Bridget. A Magnificent Faith: Art and Identity in Lutheran Germany. Oxford: Oxford University Press, 2017. This is the first study to offer an account of the Reformation origins and subsequent flourishing of the Lutheran baroque, of the rich visual culture that developed in parts of the Holy Roman Empire during the later seventeenth and early eighteenth centuries. It argues that images became prominent vehicles for the articulation of Lutheran identity. Homan, Roger. The Art of the Sublime: Principles of Christian Art and Architecture. London: Routledge, 2006, 2017. (Paperback edition) A comprehensive account of the course of Christian art, encompassing a re-evaluation of conventional aesthetics and its application to religious art. The author argues that Christian art must be assessed not in terms of its place in the history of art but of its place in Christian faith. Jeffrey, David Lyle. In the Beauty of Holiness. Grand Rapids, Michigan: Eerdmans, 2017. Lavishly illustrated with 146 full-color masterworks, this study guides readers through eighteen hundred years of Christian fine art while exploring the relationship between beauty and holiness. Jensen, Robin M. The Cross: History, Art, and Controversy. Cambridge, Massachusetts: Harvard University Press, 2017. Jensen takes readers on an intellectual and spiritual journey through the two-thousand-year evolution of the cross as an idea and an artifact, illuminating the controversies―along with the forms of devotion―this central symbol of Christianity inspires. Kilby, Clyde S. The Arts and the Christian Imagination: Essays on Art, Literature, and Aesthetics. Brewster, Massachusetts: Paraclete Press, 2017. Editors William Dyrness and Keith Call bring together the writings of the late American evangelical scholar Clyde Kilby on the arts, aesthetics, and beauty. Mattes, Mark C. Martin Luther’s Theology of Beauty: A Reappraisal. Ada, Michigan: Baker Academic, 2017. One of today’s leading Lutheran theologians analyzes Luther’s theological aesthetics and discusses its implications for music, art, and the contemplative life. Moroncini, Ambra. Michelangelo’s Poetry and Iconography in the Heart of the Reformation. London: Routledge, 2017. This book shows how in the second quarter of the sixteenth century, Michelangelo’s poetry and aesthetic conception were strongly inspired by the revived theologia crucis of evangelical spirituality, rather than by the theologia gloriae of Catholic teaching. It especially examines his Last Judgment, his devotional drawings made for Vittoria Colonna, and his last frescoes for the Pauline Chapel. Quash, Ben, Aaron Rosen, and Chloë Reddaway, eds. Visualising a Sacred City: London, Art and Religion. London: I.B. Tauris, 2017. The first examination of the religious visual art of London. Adopting a broad multicultural and multifaith perspective, its topics range from ancient archaeological remains and Victorian murals and cemeteries, to contemporary documentaries and political cartoons. Romaine, James, and Phoebe Wolfskill, eds. Beholding Christ and Christianity in African American Art. University Park, Pennsylvania: Penn State University Press, 2017. Focusing on the work of artists who came to maturity between the Civil War and the Civil Rights Era, this volume constructs a vivid new history of African American art by exploring biblical and Christian subjects and themes in the work of such noted artists as Romare Bearden, Edmonia Lewis, Archibald Motley, Henry Ossawa Tanner, and James VanDerZee. Sherman, Louise, and Christobel Mattingley, eds. Our Mob, God’s Story: Aboriginal and Torres Strait Islander Artists Share Their Faith. Sydney, New South Wales: Bible Society Australia, 2017. Showcases, in full color, over 115 Bible-inspired paintings and faith stories by 65 of Australia’s First Nations artists. Taylor, W. David O. The Theater of God’s Imagination: Calvin, Creation, and the Liturgical Arts (Calvin Institute of Christian Worship Liturgical Studies). Grand Rapids, Michigan: Eerdmans, 2017. Examines Calvin’s trinitarian theology as it intersects his doctrine of the physical creation in order to argue for a positive theological account of the liturgical arts. Taylor, W. David O., and Taylor Worley, eds. Contemporary Art and the Church: A Conversation Between Two Worlds (Studies in Theology and the Arts). Downers Grove, Illinois: InterVarsity Academic, 2017. This collection of papers presented at CIVA’s 2015 biennial conference—written by artists, theologians, and church leaders—seeks to redress the misunderstandings and mistrust that abound between the worlds of contemporary art and the church. Verdon, Timothy, ed. The Ecumenism of Beauty. Brewster, Massachusetts: Paraclete Press, 2017. Essays from Catholic, Orthodox, and Protestant artists, scholars, clergy, and theologians explore beauty as a means to unify the body of Christ. Winters, Michael. Filling Blank Spaces: “How-To” Work with Visual Artists in Your Church. Louisville, Kentucky: Sojourn Network, 2017. Written by the director of arts and culture at Sojourn Community Church, this e-book manual is for churches that are ready to start engaging the visual arts. It covers timelines for developing an arts ministry, how to cultivate a give-and-take dynamic with artists, how to assess your church’s visual culture, how to look at visual art, how to commission art, and more. Zuidervaart, Lambert. Art, Education, and Cultural Renewal: Essays in Reformational Philosophy. Montreal, Quebec/Kingston, Ontario: McGill-Queen’s University Press, 2017. Interacting with the ideas of leading Kuyperian thinkers such as Calvin Seerveld and Nicholas Wolterstorff, Zuidervaart shows why renewal in the arts needs to coincide with political and economic transformation. He also calls for education and research that serve the common good.